Pumpkin was never a favourite with me while growing up. Mom would make parangikkai puli-kuzhambu and I would carefully discard the pumpkin at the side of my plate. Parangikkai kootu, I would not even touch. All this changed once I discovered roasted pumpkin, and now I have pumpkin as the main ingredient in my meals at least twice a week. 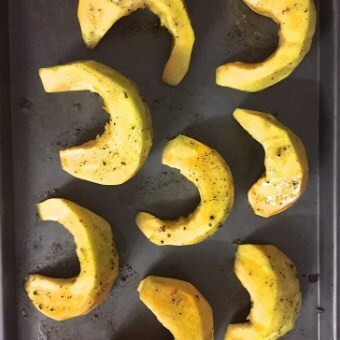 The roasted pumpkin slices are very tasty and filling when added to a salad, and the roasting takes only a few minutes of effort. 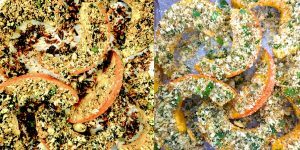 This week it was the turn of Saswati Hota who blogs at Delish Potpourri to suggest the theme at the FB Group, FoodieMonday BlogHop. Saswati offered us the choice between ‘Pumpkin Treats’. or ‘Vietnamese Recipes’. I had this plump orange pumpkin sitting on my kitchen counter so I immediately voted for the Pumpkin theme, as did the other members. How this group works is that a set of themes are suggested and put to vote by members in turn each week, and we all cook as per the finalised theme and post the recipe on the Monday immediately following. I was going to roast the pumpkin for my luncheon salad along with goats cheese, pomegranate and a heap of lettuce, but when the theme was decided, I planned the curried roasted pumpkin soup instead. 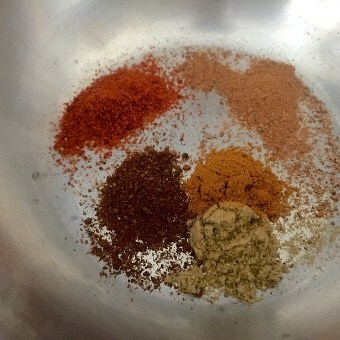 The spice powders – chilli, turmeric, coriander, cinnamon and clove, make the soup rather special. 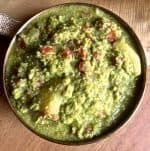 I like the kick that the fresh red chilli brings in when it is pureed along with the pumpkin and apple, but if you want to reduce the heat quotient, plea omit the chilli and only add the pinch of chilli powder as in the ingredients list. Except for peeling and slicing the pumpkin and slicing the apples, there is very little prep required for this Curried Roasted Pumpkin Soup, so don’t be discouraged by the long list of ingredients. 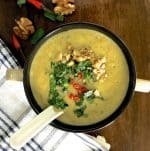 This soup is all about the flavour, and the contrast of the slightly sweet pumpkin and apple with heat of the chilli. The recipe calls for orange juice to be added before serving. Alternatively you could add cream, though the orange does give an interesting flavour to the soup. Remember to add the juice or cream only before serving and not heat the soup with either of them. Preheat the oven to 220 C (~430 F). Pare the thick skin and slice the pumpkin into even sized chunks or into thick crescent shapes. 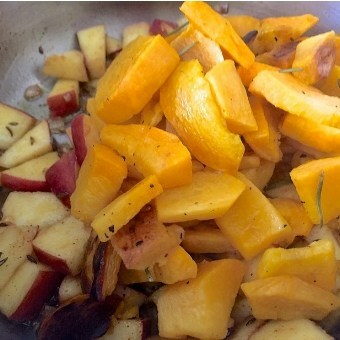 Place the slices in a zip bag and add olive oil, rosemary leaves, salt and pepper. Shake the bag well so that the slices are evenly covered with the oil and seasonings. Or mix in the oil and seasoning onto the slices with your fingers. Spread the slices on a baking sheet, taking care not to crowd them on the sheet. Roast in the oven for 20 minutes, turning the slices once half way through. Remove from the oven and quickly transfer to a bowl so that they stop cooking. Dice into small pieces so that they cook quickly when added to the soup. While the pumpkin is roasting, finish the prep. Mince the shallots Slice the apples. I have retained the peel but you may remove them if you wish. I have used a red apple but you could instead add a Granny Smith or tart green apple. This would make the hue of the soup lighter, but would change the flavour slightly by reducing the sweetness. Keep the spice powders ready Toast the pistachio nuts on a hot pan for 2-3 minutes, stirring frequently so that they do not burn. Extract the arils from the pomegranate and set aside in the fridge till required to serve. Squeeze orange juice and crush and shred a few mint leaves when ready to serve the soup. Heat Olive oil in a pan. Add fennel seeds and sauté for 10secs. 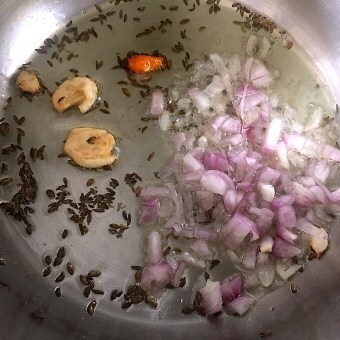 Crush the garlic cloves and add them whole, sautéing till they begin to discolour. Add the red chilli, sauté for 10 secs. If you want to reduce the 'heat' of the soup, omit the chilli. Add the minced shallots, sauté for about 3 minutes till they are nicely fried. Add the spices - turmeric, chilli powder, clove, cinnamon and coriander powder. Stir them into the shallots. Coarsely puree the soup. It is best to do this in batches when the soup has cooled down, as otherwise it may splash out of the processor. I have learnt this from bitter experience and from trying to remove the stains of turmeric and chilli from the walls and the kitchen counter! 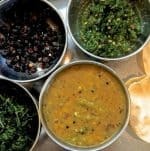 When ready to serve, reheat the soup, taste for salt and add the crushed shredded mint leaves or shredded parsley sprigs. 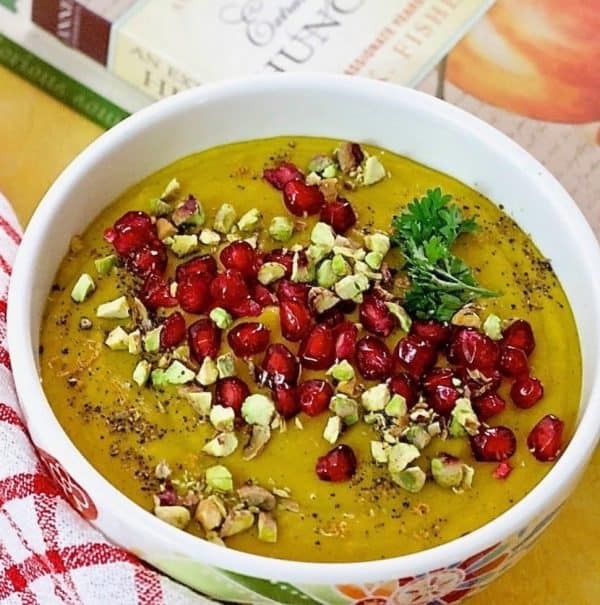 Serve hot, garnished with crushed toasted pistachio nuts and pomegranate arils. Drizzle a little orange juice on each serving. What a tempting looking soup bowl! I want this now! 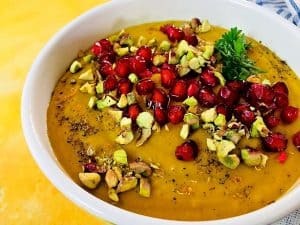 What a wonderful way to serve roast pumpkin soup with some added Indian spices, pomegranate and pistachios.. have to try this version as it looks very inviting. I usually serve it with salsa to balance the sweetness. Thank you Veena! 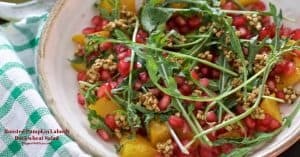 I now use roast pumpkin in both salads and soups and it makes for delicious dishes! Thank you so much, Waagmi! Love this roasted flavor of pumpkin in the soup…. Such a beautiful presentation topped with healthy ingredients. Thank you Sasmita! 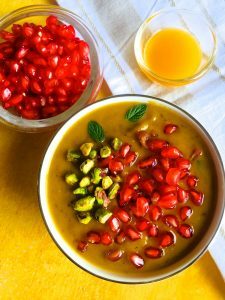 The spices and the pomegranate give an interesting flavour to the soup! Fabulous soup.Love the soup with indian spices.Deliciousness in a bowl.Love the toppings too. Wow what a recipe. Never thought of a soup with pumpkin. 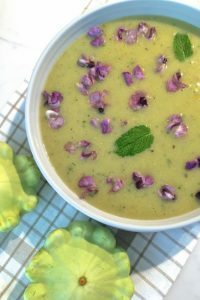 And cinnamon, cloves, rosemary, mint all the aromatic ingredients used in this soup. I am drooling. Can imagine the heavenly flavour and taste. Loved your vibrant presentation. Awesome share. I am totally coming. I love the flavor profile you have added, the crunch and juicy sweetness you have added on top, not to mention the book by the side really caught my eye. The recipe is fantastic. Loved all the spice mixes with the pumpkins. Rosemary always stands out when it comes to pumpkin and I love it too. Beautiful presentation with healthy ingredients. Thanks a lot Vidya! 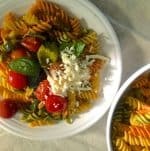 This is one of my favourite recipes! The curried roasted pumpkin soup sounds flavorful and looks very inviting with those appealing vibrant colours and toppings ! 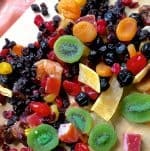 Bookmarked the recipe di..would definitely give it a try and share my feedback with you. Thanks for the wonderful share.